Growth for B2B is hard. It used to be that you could accelerate growth with huge customer acquisition. Ramping up your sales and marketing is not enough to sustain growth. Today, the best companies are growing through customer success. 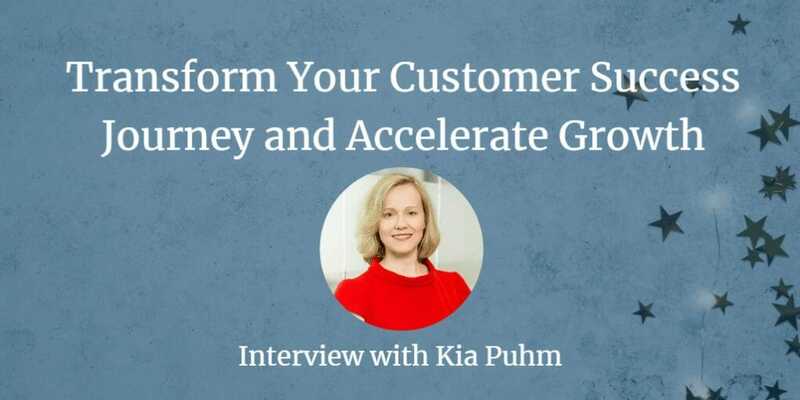 That’s why I interviewed Kia Puhm (@kiapuhm), CEO at K!A CX Consulting to talk about customer success. Kia’s got a fantastic perspective on “how do we accelerate and grow our existing customer relationships,” which is something that many companies don’t focus on nearly enough. Can you tell us a little bit more about your background? Kia: Thanks, Brian. Happy to be here. I come to software from an educational background in computer engineering and a practical experience background of 22 years in the industry working at rapidly growing, very dynamic software companies. I guess I’ve built every post-sales function and always the common denominator has been how the organizations I led get customers to adopt software so that they are using it and get value out of it. Moreover, therefore, translate into loyal customers that can translate into additional revenue at some point in time. I had to do that with a finite, limited amount of budget and resource, and so I always try to figure out how to drive that adoption equation while doing what I could or what I had available to me and use that most efficiently, if possible, to do it. What’s the most significant trend affecting your work? Kia: Great question. I’m going have to say disruption. I think with all the changes happening out there to businesses, with technology and data and information we have, and artificial intelligence, and just the way the world is changing, it’s changing how we operate. So, the biggest trend in the work that I do with my customers in helping them understand their customers and how to support that is how do you do that in a continually disruptive environment where things are always changing? Kia: There have been many studies done and much research that shows that companies that are operating from a customer-centric viewpoint (that deliver amazing customer experience) far outperform their competitors that aren’t customer-centric. So, I do think that that is where companies are moving toward, and that is how we adapt to all these changes that are continually happening. The reason I think that’s important is not only the obvious (customers stay loyal when they have good experiences and that the product is delivering on the promises that it says it’s going to deliver) but also as our customers keep evolving and changing, so too are the ways that we operationalize that and support those customers. If you are customer-centric, it means you are observing that evolution that’s happening to your customer base, and you’re able to be very agile and nimble in responding to that as a business. If you keep using that information, that observation of a customer, either passively or through active engagement with them to find out that information, you could feed that into your organization and continually change and respond to that to continue to drive that value for customers and that loyalty that you need to keep growing your own business. Kia: I know you, and I have had conversations at other times and have completely aligned regarding the type of approach that we use. I use customer journeys to facilitate that customer-centric thinking to make sure that an organization understands empathizing, understanding what customers are trying to accomplish when they purchase your products. When you understand it from the customer viewpoint, specifically, as it relates to software, how you support and deliver the various services that you need to in order to help that customer adopt that software fully and continue to drive ongoing value from that software, can dramatically change when you look at it from the customer’s standpoint. What I see all too often, and it’s so natural for us to do this as vendors, is we define the value proposition that our product is meeting in the market, and we organize ourselves for how we’re going to deliver on that value proposition, and then we tell customers all about that. It’s a very vendor-centric approach, and while we don’t walk in their shoes, it’s that we’re trying to push the product in an environment that we’re not necessarily familiar. I think problems with retention and why customers have difficulties adopting software is not because they don’t necessarily understand the value or that they can’t learn the software or understand it. It’s because we put the onus on them to understand how to operationalize, how to take that software and put it within their environment. Why, in general, our customers buy our products? What do their environments typically look like inside? What are some of the common trends and challenges that they have in their work environment? How could that software seamlessly or best fit into that? We can now take a lot of that burden off that customer. We make it easier. We make it more enjoyable to bring that software into their organization. Moreover, the faster we do that, the more we make it feel seamless and easy and have a better experience with that, the better they’re going to adopt it. Then they’re going to recognize the value because it had felt easy and it’s going to meet the objectives that they set out to achieve when they purchase the product, and that then translates into loyalty. When you build that loyalty through trusted advisor-type of relationships, that’s where you can start to talk to them about doing more, which is that ultimate nirvana of expansion and driving more revenue out of that install base. I use those journeys as the beginning step of understanding, walking in the customer’s shoes, seeing what that looks like, so that then we can figure out how to align organizationally to that journey and translate that into something that makes sense from them, from their perspective because it’s coming from their perspective in the first place. Brian: I like the way you think Kia. For our regular listeners and readers, you just heard the episode with Brent Adamson from Gartner. Brent said that as much and as for how difficult it is selling B2B today, for our customers, buying is even harder. I think we’re still in the infancy of journey mapping. I mean, some people are quite advanced in it and companies that are advanced, and there’s much information out there on how to conduct journey mapping and how to do that quite effectively. When I talk about the infancy, I think we map out the customer’s journey, but we still do it from our perspective. In the work that I do, I haven’t seen that yet. I’m waiting for the day that somebody shows me a journey map that they’ve done that reflects the customer’s viewpoint and their perspective versus a vendor-centric approach. If you’ve got that journey, then you start to add on “What is in place? What is that methodology?” Not just processes, but the role alignment and systems alignment, and technology that needs to be in place to support that customer journey. Now you’ve got this business model, and then if you’ve got this closed-loop feedback, where you’re getting input from customers, and you’re feeding it back in: this is where the agile comes in. You can then respond to that and continually improve your operations as you’re getting that feedback from customers as they’re evolving so that you’ve got this agile, optimized business model. That’s where I think journey mapping is not just the mapping per se. It’s how do you operationalize all that and create that agile business model, this is where I think is the next stage in evolution. To your point about empathy, it’s just common sense. How can you understand someone’s point of view if you’re not thinking from their perspective? I think that takes just that skill set of empathy to be able to understand that. That’s the interesting work that I quite enjoy doing with clients; it’s getting those “Aha!” moments where “Oh. Wait. I thought I was doing it from the customer’s perspective, but, ah, now I see. I’m not thinking from their perspective,” and then just that training to keep thinking from the customer’s perspective, and then things start to click, so just honing those empathy skills. Brian: What I hear from you is to understand how people think really, we need to understand how are they thinking about their business now, but also understand the emotions. What are they feeling at various points of their journey? Do I understand correctly? Kia: Yeah. Absolutely. I mean, that’s a component. In the industry, people often refer to the concept of “moments of truth,” right? Moments of truth can make it or break it interactions that customers have with your company as a brand that could be deciding factors of whether they continue to be your customer or not. They also tend to be highly emotionally charged at those moments of truth, and then there are other times in the journey that might not be critical moments of truth. I think there are emotional elements there that help to understand that customer perspective. So you need that emotional component as well, and understanding of that because what needs to done at a certain step in the journey can get delivered in multiple different ways. Well, if you know what the feeling of that customer might be, if they’re feeling angst about using the software, if they’re feeling excited about it, if they’re feeling bored about it, you might approach the discussion with the customer differently. You might approach how you’re instructing them differently or how you’re working together with them. Those things all impact, and so when you have that visibility into that, you can be much more targeted and effective with how you are moving that customer through that journey. How can others start to improve customer success? Kia: That’s a great question. Sometimes, it can feel overwhelming or very abstract. People often confuse customer success or customer experience with just making somebody happy or feel good. I look at it very much as a disciplined way of operationalizing how you’re going to engineer an amazing experience for customers, not only in the business outcomes they get but also that emotional experience so that it can become a very consistent, repeatable methodology and approach. Journey map and understand what would that look like from the customer’s perspective. You will start to see how is your organization aligned in each stage of the journey to support that journey and those emotional points in that journey or those critical moments of truth. This is where this concept of agility is what I think is so empowering and why I employ it with my customers and why I think it’s so powerful is that mapping these things out. Maybe you don’t get it right, but if you start to have this concept of closed-loop feedback, where you’re reading and understanding the customer more and more, then you can start to make that continuous improvement and really create that agile business model that keeps getting honed and refined as you learn more about it. You don’t have to have it right and perfect at the beginning. You might have it completely wrong, but if you map something out and you start to observe it and validate whether things are right or wrong and start to use customer feedback to inform how you should tweak operations. Alternatively, what you’ve got in place to provide a better customer experience, that’s where you’re going to optimize that approach, and it should continually be dynamic forever. None of us have static customers. They’re just as dynamic as we are in our business operations, so let’s make sure that we’re continuing to observe them and see how they’re improving or what they need help with and build that into our model so that actionable advice is journey map. Build some initial model, observe it, and then keep honing it. It’s not just a one-time effort.